Start a new project if you've just signed in (to learn how to sign up or sign in, see: logging in to Create). From here you can start a project by clicking the Start new project button. The button is on the top right hand side of the screen. In the window that appears, enter a project title and choose an aspect ratio from the drop down (e.g. widescreen, square, classic). Then click Create Project and your new project will open. If you'd like to know how to start editing a video in your new project, check our how to edit a video help article. It provides tips and images that show you how to use Create's editing features. 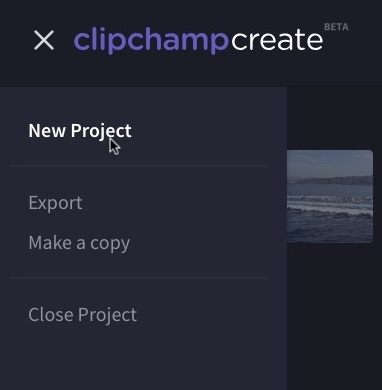 If you're already in a Create project, close the project by clicking on the clipchampcreate logo in the top left of the screen. This will return you to your Projects Page, where you can use the Start new project button, as shown above, to start another project. You can also click the top left dropdown menu next to the logo in your existing project and click New Project.